JNTUH College of Engineering Hyderabad (Autonomous). 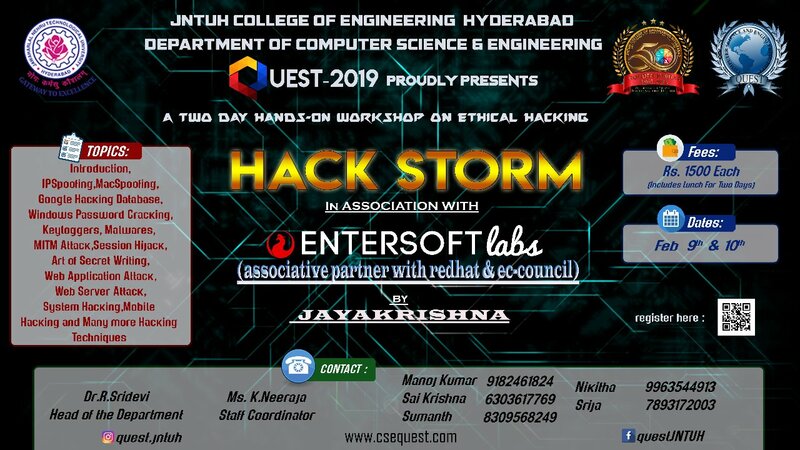 A pre-hackathon workshop on 'Internet of Things', organized by Statup-cell of JNTUH College of Engineering Hyderabad under TEQIP-III on 20th December 2018. 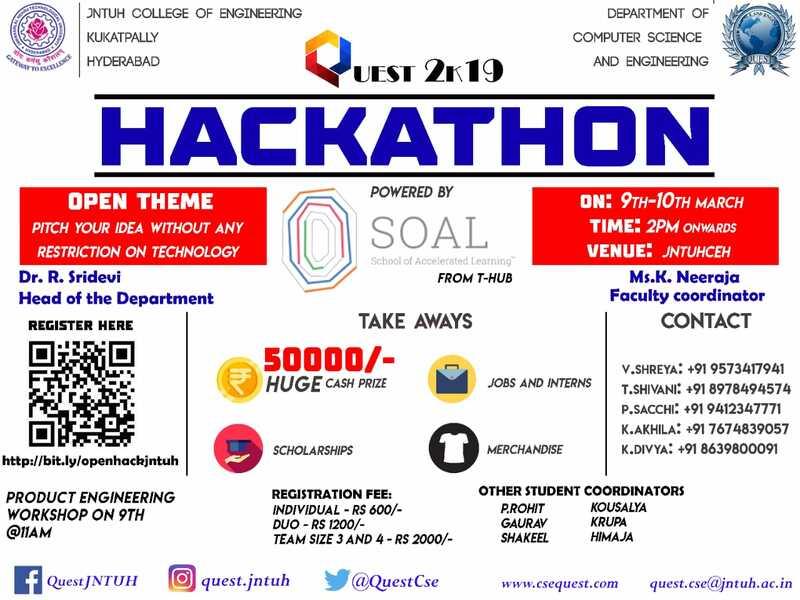 A 36-hour Hackathon on SMART MACHINES on INDUSTRY 4.0 organized by Startupcell , JNTUH College of Engineering Under TEQIP-III on 21st and 22nd December 2018. Two-day workshop on "REAL TIME SIMULATIONS OF ELECTRICAL SYSTEMS", during 17th - 18th August 2018 in EEE Dept, JNTUH CEH. 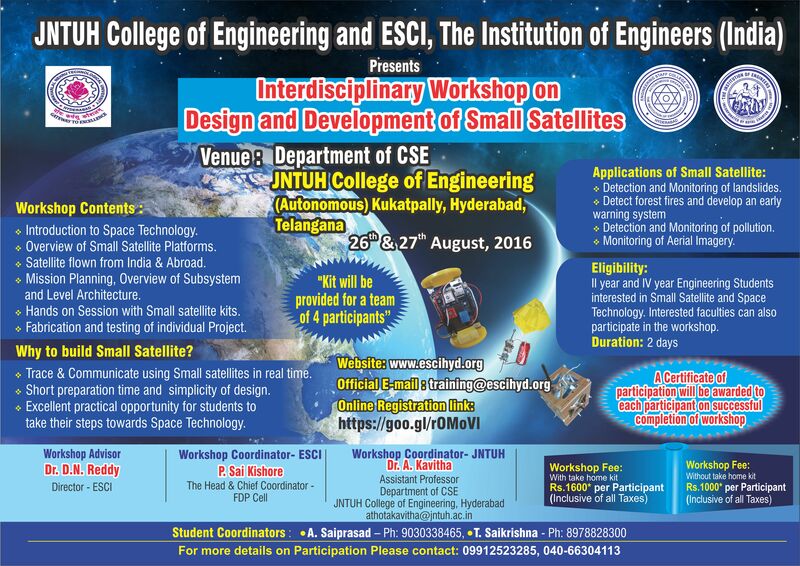 A Two day Research Workshop 2018 jointly organized by Department of CSE, JNTUH College of Engineering & IEEE Young Professionals, Hyderabad during 23-24, JUNE 2018. 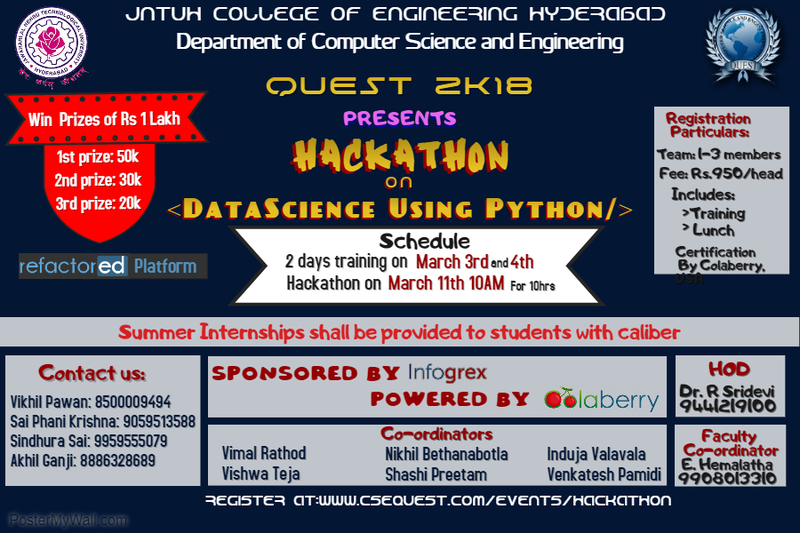 A 10hours "HACKATHON" on DATA SCIENCE USING PYTHON on 11th MARCH and Training session on "DATA SCIENCE USING PYTHON" on 3&4th March by DEPARTMENT OF COMPUTER SCIENCE AND ENGINEERING under QUEST 2018. "One week Finishing school on R-programming " from 01-06-2016 to 07-06-2016 Conduct the CSE Dept. (under TEQIP) JNTUHCEH. A One-week Faculty Development Programme (Under TEQIP-CoE) on Software Engineering during 22-03-2016 to 27-03-2017 organized by Department of CSE, JNTUHCEH. Postponement of International Conference on Advanced Materials and Manufacturing Technologies (AMMT) from September to December. NBA Workshop on OBE (Outcome Based Education) and OBA (Outcome Based Accreditation) during last Week of July / First Week of August, 2013. © Copyrights Reserved. 2008. JNTUH College of Engineering Hyderabad (Autonomous).